Fellini's Roma - Catholic Church Fashion Show /Enjoy! "Throughout the centuries the faithful have felt a devotion to Mary as priest." It consisted in the strong belief that Mary was, indeed, a priest. Tradition indicates four main reasons: Mary belonged to a priestly family, Mary exercised priestly functions, Mary gave us the Eucharist and Mary procures forgiveness of sins. Tradition stressed especially Mary’s role as a sacrificial priest. Mary’s role as Sacrificial Priest is seen particularly in her offering Jesus during the Presentation in the Temple and during his crucifixion on Calvary. Devotion to Mary Priest blossomed greatly among ordained ministers. Mary was seen to have a special relationship to priests, not least in the celebration of the Eucharist. Read the witness of theologians and spiritual writers, with references to extensive quotations. The devotion to Mary Priest was also expressed in religious art. Visit our gallery of images of Mary Priest. " The art work depicting Mary, Mother of Jesus, as priest is stunning.Enjoy! Thanks to Women Priests Website for its excellent scholarship and for the contribution they have made to our movement by their intellectual presentation from sources in scripture, tradition, and contemporary theologians. "Hipocrisy" by John Chuchman/Translation of Lord's Prayer in Aramaic/ "O Birther, Mother/ Father of the Cosmos"
Our Father . . . Who art in heaven . . .
of the Cosmos . . .
of both Masculine and Feminine Essences. choose to make God masculine. when it comes to church authority. in a way that serves their control. and powerless in the church on the other hand. Honoring Women as Equals is Divine. This is the worst kind of Hypocrisy. than sexual relations with women? God is not male and to use only male language in official worship implies that God is male which is idolatry. God is beyond all names and images and certainly can be named and imaged with feminine metaphors as well as male metaphors.The real issue is honoring women as equal images of the divine in everything and that means women can and should preside at Eucharist. Excellent work, John! Thanks for this powerful reflection. "One Burnsville woman took a leap of faith this past Sunday"
"Monique Venne was ordained June 26 as a priest at Plymouth Congregational Church, 1900 Nicollet Ave. in Minneapolis. This ceremony was the third public Roman Catholic Womanpriest ordination in the Twin Cities. Bishop Regina Nicolosi ordained Venne a priest...Now, she is a co-pastor of the Compassion of Christ Catholic Community with three other womanpriests. Their church rents space from Prospect Park United Methodist Church in Minneapolis, and holds a 5 p.m. service on the first, third and fifth Sundays of the month..."
"Before co-pastoring at her own church, Venne was a highly active member at the Church of St. Edward in Bloomington. She interned at the church while she was in seminary and credited Father Mike Tegeder for being helpful and supportive of her journey...In his own church, Tegeder said women participate in ways that are equivalent to a man who has been ordained, participating as directors of faith and liturgists. "I hope our Church leaders reflect on this," Tegeder said. "We have to open our minds to new possibilities." Congratulations, Monique and blessings on your ministry as a priest serving The Compassion of Christ Catholic Community. What a beautiful name that reflects the love of Christ for all. I also commend Fr. Tegeder for his positive affirmation of your ministry. It seems to me that we may be approaching a tipping point on the issue of Roman Catholic Women Priests. Maryknoll priest Fr. Roy Bourgeois led the way by attending the ordination of Janice Sevre-Duszynska., and never stopped speaking out on this issue across the United States. Now there are male priests in Austria, Ireland and theologians in Germany, Austria and Switzerland who are speaking out for women priests. Even a Cardinal from Portugal, a bishop from Switzerland, and Australia are joining the groundswell that has been growing in recent years. What is the Vatican going to do now? The Sense of the Faithful is speaking loudly and clearly! A holy shakeup has begin, a revolution for justice for women in the church is on the move! Let us rejoice that the Holy Spirit is birthing a renewed church now in our midst! · In every Church service they will say a public prayer for Church reform. · They will not refuse communion to well-meaning Christians. These may include divorced and remarried, members of other Churches, at times people who have left the Church. · They will avoid saying multiple masses in many centres. They will prefer services conducted by people themselves to artificial supply services. · From now on they will call a service of the word with distribution of holy communion a 'eucharistic celebration without a priest'. This will fulfil the Sunday duty. · They will ignore the preaching prohibition imposed on competent lay people. 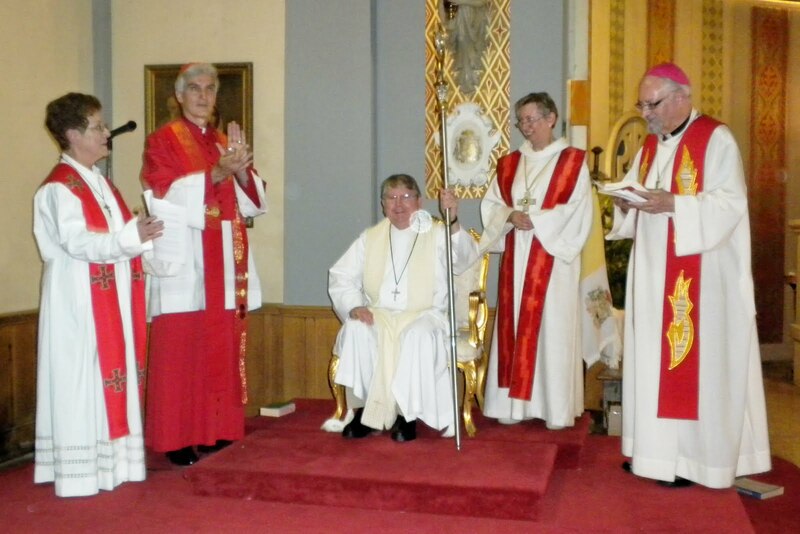 · They will see to it that each parish has a lay chairperson: a man or woman, married or not. This to counter the joining up of parishes and of projecting a new priestly image. · They will use every opportunity to publicly promote the admission of women and married men and women to the priestly ministry -- seeing in both men and women welcome colleagues in our pastoral ministry. Bishop Jim Burch resides in N.VA. Please respond to him directly if you are interested in reading the other parts of this presentation. Also, respond to him with your feedback. He is looking forward to the conversation. But none of what we have talked aboutdoing to make the church more vibrant and responsive to the needs of people today will "reconstitute," in new form, the parish/local church as it exists today. That structure is in its death throes, and will not last in its present form. The "parish" of the future will be remarkably different from what is taken as a given today. A couple of years ago I had lunch with a Roman Catholic pastor of a large suburban parish, himself very conservative and a member of Opus Dei. After we warmed up, he admitted something to me that I never expected. This was a man who had started a suburban parish from scratch, had a new $5 million plant, had 3,000 - 4,000 parishioners, and who took in $25,000 - $35,000 per week. By "objective" standards he was a huge "success." Yet he told me, "We (and I knew he meant other Opus Dei, conservative RC pastors) know that this is all over." The "this" he was referring to was the parish as it exists today. "50 years from now, parishes won't be anything like this at all," he said. So - a shock - even our conservative friends know it, but won't usually say it out loud. Pick the best and the biggest parish (Catholic) or local church (Protestant) you can think of. Usually, the big ones are 4,000 -6,000 parishioners. At most, they will have about 25,000 members. Yet they will draw on a population of 500,000 or more! So even the "best" (i.e., "biggest") of the local churches will only attract a minority of the population from their market area. There is abundant evidence that even the most "successful" of churches only can get a small sliver of the people they try to attract. In the early 21st Century, an estimated 20% of Protestants and an estimated 25% of Catholics are actually in church on any given Sunday. This structure is over. Here is what the spiritual community of the future will look like, I think. I am MOST interested in your ideas, suggestions, additions, corrections, prognosticating, vision. Let's get busy working on this now. 1. Very few annual large liturgies will be held for the general population ... perhaps Christmas, Good Friday and Easter, Pentecost and Thanksgiving. Sunday services will not be as large as they are today, for fewer and fewer people will attend. The large special services will be held in the existing churches of today, in new multi-purpose buildings, or in public rented venues. People of mixed Christian/Catholic denominations will gather together, irrespective of minor differences. Because these will be relatively e rare and voluntary, and because they will be prepared well and not so often available as today's every-Sunday-liturgy, they will be well attended, if fact, bulging at the seams. Pastors will also have learned that they have to do it well or they will lose out to those who do. 3. Small Communities of Faith will still exist, but they will remain almost as rare as today, and not too much more popular than today. As today, they will comprise from 5 to 20 people usually (50 on major holidays will be considered a big achievement), and top out at the rare community of 100 people. Those who attend will be strong in their attachment, but natural attrition will occur and replacements hard to find on a constant basis. 4. Home Eucharists will be everywhere. Very short and informal liturgies, in the colloquialisms and language of the people present, will be used widely by Christians at almost every meal where "two or three" or more gather. There will be the breaking of the bread and the blessing of the wine, and the sharing to remember Jesus present. Families and their guests will grow comfortable with this spiritual remembrance, and there will be various paragraph-or-two "lessons" available from many sources to make each short liturgy interesting, new and meaningful. The head(s) of the household will lead these Eucharists. The larger parish, which will only see most of these people on rare large feasts (described above), will encourage these family/friend gatherings through email and blog contact. These gatherings will feel a part of the larger parish in this way, if at all. 5. Reading of the Scriptures in Small Home/Friendship Groups. This will occur, particularly when the New New Testament gets rolling (more on this in the future). The New Testament was written to be read out loud in a group and discussed. This will happen, because the New New Testament speaks more clearly and powerfully than even its beautiful predecessor. 6. Special Occasion Excursions will be organized by the parish ministry. Parish ministry may or may not be associated with a building. There will be gatherings at parks for specific age groups, at pools in the summer, along walking trails, picnics at beautiful locations, ski trips, weekends at the ocean or the lake, group meditations waist-deep in the surf, visits to national public monuments and discussions to follow, and a myriad of experiences organized by leaders of children's groups, teen groups, young singles, married couples with and without children, older people, retirees, etc. These will be organized for the fun and the learning and the opportunity to talk together about some spiritual-related topic, carefully thought out and presented by the ministerial organizers. These will be fun and they will be enriching at the same time. It this way, a great majority of people will greatly be attracted to them. 7. Special Occasion Liturgies will be a constant, as long as they are done well (most are not now) and not straight-jacketed by imposed rituals from afar: weddings, funerals and baptisms. These may or may not be in the church building. No matter. These are the occasions people want to celebrate the spiritual reality of their momentous life passage. They will come for joyful and meaningful celebrations, but not for lifeless rituals overlaid by rules and regulations. The parish or other organized structure for ministerial staff will have to be ready for lots of these milestone-type liturgies once this structure becomes more accepted. 8. Connection of the Community by email and blog. This will be the way a self-realized group stays connected with each other. These groups/parishes of the future may or may not be geographic. They can be organized around current churches, new building-less churches, neighborhood associations, senior clubs, sports clubs, travel clubs, even large families or other natural groupings. They will be local groups, and they will be widespread, based on similar interests. 9. Spiritual Television and radio shows will become more available in entertaining and educational format. Not the piety and overlaid sauce of EWTN, but in positive, contemporary theology, dressed up in song, staging, inter-active participation, Q&A and other traits of what society does in this contemporary world. This, I believe, will be the way most people in the times to come, get their spiritual "classes," how they learn about their faith. Obviously, theological slicing and dicing will not move the masses. Only thoughtfully presented, least-common-denominator presentations will work. This is not a criticism of the process to come. It will not be "watered-down." Presentations that actually sink into people, which motivate them to be better and to change their lives toward becoming their best selves, are the presentations that are life-changing, not theological weed-whacking. What are we about here with this Christ-life, after all? This is the formula for saving a lot of existing parishes/local churches, which are very quickly becoming anachronisms. However, you may also notice that a community of the sort described above does NOT NEED a physical building. In fact, it may find the going a lot easier without that baggage. Large annual liturgical celebrations can take place in beautiful rented buildings, manor homes, hotels, parks or any appropriate place. In the summer warm months, they could be under roofed-pavilions at local parks. The priest pastor would encourage small communities of faith and vouch for their choices for ordination. He or she would likewise encourage home Eucharists and organize the exploratory trips sponsored by the parish leadership ministries. He or she would be the main point of contact for weddings, funerals and baptisms. The community would be joined through the parish blog and emails. Such communities would belong to a diocese, not necessarily geographic, perhaps of like-minded people of similar spiritual persuasion (as is the Catholic Diocese of One Spirit today). Liturgies can be sent out by the diocese for use or alteration by the communities through the priest who serves them. This is a model for community NOW. Through the Catholic Diocese of One Spirit, it is not a structure that has to be waited for. We want to implement this as a model immediately, and encourage any who want to be a part of a church like this. I ask for your input: shall we add this to our agenda of our diocese? It would not replace anything, but would be in addition to what we are already doing. Should other organizations also use a model like this? PLEASE GET BACK TO ME AND GIVE YOU YOUR THOUGHTS - WHETHER YOU AGREE OR DISAGREE, WHAT ADDITIONS OR OBSERVATIONS YOU MAY HAVE. THIS IS QUITE IMPORTANT. LET'S MAKE IT A DIOCESEAN-WIDE DELIBERATION! IF YOU ARE NOT A MEMBER OF OUR DIOCESE, PLEASE ALSO JOIN IN. THIS IS NOT JUST FOR US. WHAT MODEL(S) SHALL WE HAVE READY FOR THE DAWN OF THE NEW CHRISTIAN ERA FORMING AS WE READ? Part 1 previously observed that - other than for a minority of people - the historical structure of "church" is collapsing all around us. Part 2 then observed that the new face of the Church is all about us. Part 3 recorded that several important theologians have believed that the Vatican is in schism for dismantling the Second Vatican Council ("ecumenical councils trump popes"). Part 4 built on the first three sections and looked at where we are now in this new phase of opening the Church to its new dawn. Wow! Who is this Cardinal who breaks ranks with the Vatican on women priests? What a blessing it is to hear a prominent theologian and leader of the church speak out for justice and equality for women in our church! Imagine the panic in the CDF (Congregation for the Doctrine of the Faith, formerly the Office of the Holy Inquistion)! What can the Vatican do to punish Cardinal Policarpo -- take his red hat away and throw it in the Tiber? In the past several years anyone who supports women priests - like religious orders, for example --find themselves under investigation and in big trouble with the Vatican. Even bishops lose their jobs if they even think about women priests as a solution to the priest shortage. Bishop Morris wrote a pastoral letter that raised the possibility of women's ordination and several years later, he was "sacked" by the Pope. The Vatican is pushing the Maryknoll Order to dismiss Fr. Roy Bourgeois for his attendance at Janice Sevre-Duszynska's ordination and for his ongoing support for women's ordination. Apparently excommunicating Fr. Roy was not enough! The fact that Fr. Roy has given talks in support of women priests to thousands of people in the U.S. and that he appears in the new documentary film "Pink Smoke Over the Vatican" has irked Vatican officials to try this risky strategy. The result proves my theory that the Vatican is the gift that keeps on giving. Thousands of people are supporting women priests and expressing their support for Fr. Roy. Thank you Cardinal Policarpo for affirming Gospel equality for women in the church!! I hope there will be women priests soon in Portugal! Pastoral Ministry With Children and Adolescents: Judy Lee Shares Reflection from Vacation Bible School/ Ft. Myers, FL. While I do wish I had a youth worker so I could do more, working with these kids is exhilirating because they are learning the Gospel so well in word and deed, and because they are fun to be with. The eagerness and excitement they expressed at making a garden and planting vegetables was a joy to share. seeing sea birds, and being in the water of any sort-but especially the Gulf. Their awe at feeding baby goats at the petting zoo. Their abilities at sports and eagerness to learn about our loving God. Their recall of past Sunday lessons and their connecting to present lessons: Jakeriya is a small 9 year old girl- you have seen her dance at our Ordinations. When we were reflecting on Jesus’ love she said: I remember the time Jesus healed ten lepers, and no one wanted to go near them. But only one said thank you-we should say thank you to God for Jesus healing people like us. !!!!!!! And TyJae,15, said in response to another group member who wanted to go to a skating rink for a group trip: no, I don’t think we should go just anywhere, we are learning about what God did to give us a beautiful world we should go find the world the way God created it, like we did at the beach, or at the zoo. We can deal with what people made anytime! !!!!!!!!!!!! Or Jolinda a strikingly beautiful ebony teenage girl who painted her new identity on her TeeShirt: ChurchGirl!!!!! Or Marcella our Italian American 9 year old once so shy she couldn’t speak who was the only one who could define what chaos meant and then said-and God put order in all that mixed up jumble! She also painted a beautiful circle in gold on her Tee shirt and surrounded it with concentric broken circles and bright rays with a cross discecting the concentric circles. It was a piece of art worthy of any adult artist. She said “I don’t know what it means, but God is in the middle of it”.!!!!!!!!!! And, finally, Joelle our four year old simply makes everyone laugh and feel joy because she is so happy to be at Bible school and her zest for life is filled with grace. All of the kids love her, when she was a bit late to the first class her Mom apologized as she had to hurry from her morning job, but, she said, Joelle told her that God and her friends at church are waiting for her so they had to hurry! And to hear them sing fervently”Thank you God, Thank you God, we just want to thank you God” would make you weep-happy tears. Reflections of a Worker Bishop On My Ordination as a Bishop - William J. Manseau, D.Min. In the end it came unexpectedly. For years I have been doing the work of a missionary bishop here in the United States and beyond, since Vatican II, among the various Roman Catholic communities and individuals which make up “the transformative church from below”, or yeast in the dough, as found in the Federation of Christian Ministries, CORPUS, the International Federation of Married Catholic Priests, the Women’s Ordination Conference and more recently the Roman Catholic Women Priests movement offering servant leadership in a variety of ways. I have also tried to minister to the “church from above” as represented by the National Conference of Catholic Bishops, the National Federation of Priests’ Councils and the Vatican by attendance at various meetings, nationally and internationally, and by correspondence. In my mind, the work of a missionary bishop, as I see it rooted in the New Testament communities and subsequent tradition, is to promote, support and encourage the ministries of others as they seek to bring leadership and be of service to disciples of Jesus, other spiritual seekers and the world at large. So, I have known for some time that I have the charism of a bishop. It has been affirmed by many over the years. It just had not been sacramentalized by the Catholic community of faith. The American Catholic Council (ACC) gathering in Detroit, Michigan, the Gateway to Freedom City for African Slaves, on Pentecost weekend 2011 provided just such an opportunity although I did not realize it until about one month before. In the midst of preparing to attend the Council I became aware that Peter Paul Brennan, Archbishop and President of the Married Priests Now! Catholic Prelature initiated by married Roman Catholic Archbishop Emmanuel Milingo from Zambia Africa and Christine Mayr-Lumetzberger, Roman Catholic Women Priests Bishop from Austria would themselves both be in attendance as well, as the three of us would be participating as delegates to the Second General Assembly of the London, England based International Federation for a Renewed Catholic Ministry which was being held on the day that the Council was opening as an expression of international solidarity with the ACC. For some time both of them had been expressing encouragement for me to accept ordination as a Roman Catholic bishop as had members of our community, the International Society of the Apostles, Sts. Peter, Thomas and Mary Magdalene to help promote the ecclesial movement for reform and renewal by taking action on our beliefs. Suddenly, the moment was in front of me when they both concurred that we should proceed in Detroit. The moment which presented itself had been building for a long time. The two most recent preparatory events were the Papal Year for Priests and the Dutch Dominicans’ Document entitled, “The Church and the Ministry.” In 2009 Pope Benedict XVI announced a Year for Priests, which according to Cardinal Tarcisio Bertone, Secretary of State, was include “those priests who have been put to the side in pastoral ministry” for various reasons. It was to be a time for “a renewal of contact, fraternal help, and if it is possible, a reuniting with those priests who for various reasons have left behind their priestly ministry.” I responded in my capacity at the time as President of CORPUS to the Cardinal and to 408 Roman Catholic bishops in the United States and wrote that “we rejoiced that at long last a time has come when we priests who ‘for various reasons have left behind their priestly ministry’ may share with our brothers in the episcopate as brother priests in this ‘renewal of contact’ what is in our hearts. We hope to share the faith and love which has sustained us as pilgrims in this painful time.” I received three responses from the 408 bishops in the United States and nothing from the Vatican. Moreover, when I attended the fall 2009 meeting of the National Conference of Catholic Bishops in Baltimore none seemed to have heard of what Cardinal Bertone had said was to include an outreach to us. I came to the conclusion that we and the millions of people of faith whom we represent as persons of conscience had been abandoned by the institutional authorities except on their terms. All else is rhetoric. The Council of the Dutch Province of Dominicans published in 2009 (Kerk Hardop, Netherlands) the results of a study which they had commissioned to determine whether it is possible that the church community or the pastors which it has appointed celebrate validly and licitly the Eucharist themselves. They undertook this research in response to the current pastoral situation in Holland in light of a new view of the Church flowing from Vatican Council II. Their answer was in the affirmative. They said: “We urge our faith communities to realize what is at stake in the present emergency situation and take and be allowed to take the extent of freedom which is theologically justified to choose their own leader or team of leaders from their own midst. On the basis of the priority of ‘the people of God’ over the hierarchy a diocesan bishop may be expected to confirm such a choice after due consultation by the laying on of hands. If a bishop should refuse such a confirmation or ‘ordination’ on the basis of arguments not involving the essence of the Eucharist, such as obligatory celibacy, parishes may be confident that they are able to celebrate a real and genuine Eucharist when they are together in prayer and share bread and wine. We urge parishes to act in this way with a great amount of self-confidence and courage. It is to be hoped that, stimulated also by a relatively new practice, bishops may in the future live up to their commitment to serve and eventually confirm the leaders of local communities in their office.” Powerful words indeed. I submit that ‘a fortiori’ that it would seem that when a community lays its hands in prayer upon someone that they have designated and intended to be their pastoral leader then that person is sacramentally ordained or consecrated validly for that purpose and if they designate such a person to serve as in an episcopal role then such is that person. If they designate such a person as a presbyter, then such is that person. If they designate such a person to be a deacon, then such is that person for them and their missions. It is for the wider church to recognize what they have done in the spirit of communion. But the history of the church, as we have it is a bit more complicated, for the church remembers through its scriptures and tradition that when the community has selected someone for leadership ministry that “They brought them to the Apostles who prayed for them and laid their hands on them.” (Acts 6:6). Since the original Twelve did not have successors as such since they were unique in the Church, it became recognized that they were succeeded as teachers and guardians of the Apostolic Kerygma and unity (fraternitas) by those whom the faith communities ordained for that purpose as representatives and guardians of the faith of those communities. These episkopoi formed a college which spanned the individual communities and became part of the process of the transmittal of the faith of communities. (J.F. Puglisi, The Process of Admission to Ordained Ministry, Vol. 1, 1996). So, the understanding of the Church is that a bishop is necessary for the ordination of another bishop and preferably more than one in order to manifest the college into which the candidate is entering through the imposition of hands and prayer at the request of the Catholic community in its proximate expression. (“For where two or three are gathered in my name, there I am in the midst of them.” Mt. 18:20); (CJC, can. 1012, 1013, 1014). More remotely, I was prepared for this moment by an adult lifetime of Christian charismatic spirituality and experience as a Roman Catholic. I was introduced to the Charismatic Renewal in 1963, two years after my ordination as a priest. This came about through my involvement with the Catholic Messengers of the Bible, a Roman Catholic outreach ministry which fostered personal and social transformation, lay led house churches and ecumenism. Through that ministry I came in contact with the Koinonia Movement and then subsequently the Charismatic Renewal in North and South America in which I became an active participant and leader. I was a witness to the power of the Word and the Spirit in the transformed lives of people without the necessity of institutionally ordained ministers although I clearly recognized their usefulness when they were “in the Spirit.” Leon Joseph Cardinal Suenens was a prime example of such a minister. It was he who was responsible for the institutional Church’s acceptance of the movement as Kilian McDonnell, OSB has made clear. (“Open the Windows, the Popes and Charismatic Renewal”, 1989). It was from Kilian McDonnell that I originally learned years before that the presidents of Eucharists in the early ages of the Church included the ordained, the survivors of martyrdom and wondering prophets. Years later this background in Catholic Christian charismatic experience and spirituality enabled me to understand and support Zambian Archbishop Emmanuel Milingo’s spiritual journey when he married and initiated the world wide Married Priests Now! Catholic Prelature which I have written about in another place. He too had experienced and lived in the power of the Baptism in the Holy Spirit which the theologian Edward Schillebeeckx repeatedly turns to in “The Church with a Human Face” (Crossroads, NY, 1987). As I arrived in Detroit on June 9, 2011 I felt conflicted as I travelled to the hotel and Cobo Hall Convention Center. Intellectually I was convinced that I was on solid ground for the reasons I have expressed above. Yet I was uneasy. Although the majority of individuals I had consulted as part of my discernment as to whether to proceed had been affirming and some enthusiastic, yet some of my closest advisors were less than enthusiastic and some were opposed. My principal communities were in agreement. Three bishops were assembling for my ordination. The paper work had been accomplished and most of the preparations made. All that remained was to identify a place where the ordination could take place without disrupting the American Catholic Council. The first order of business upon arrival at the hotel was to attend a meeting of the Executive Committee of the International Federation. I expected that we would have dinner together following the meeting but was disappointed to learn that everyone else had other plans. I felt really alone. At this point I began to become aware that a Higher Power was at work. One of the communities for which I was going to be ordained is the St. Barnabas Mission. Barnabas is called an apostle in the New Testament. It was he who spoke up for St. Paul after his conversion and introduced him to the apostles. He was called a “son of encouragement” by the apostles (Acts, 4:36). A colleague of mine several days before in the pastoral counseling center where we work referred to me as “a real Barnabas” for a patient of mine who has attempted suicide a number of times during the course of therapy. He had no idea of my connection to the St. Barnabas Mission community but for me it was an affirmation of the path I was to follow later that week in Detroit. Now Peter was ministering to me and I was beginning to feel a subtle peaceful confidence that things would work out. He was being a Barnabas to me. We reviewed the Roman Ordinal which we were to use and I told Peter that I could not make the promise of absolute obedience to the Bishop of Rome which it requested. So we modified the text to say that I would give my obedience in so far as the Pope reflected the Catholic Church’s core beliefs. That evening, Peter, Dr. Carl Yusavitz and I returned to the hotel following the American Catholic Council’s opening session in search for something to eat. All of the concessions in the Food Court except for one were closed except for a Subway which had a few people waiting in line. We headed there. As I arrived ahead of the others and stood next to the last person in line the attendant said, “We are closed.” My companions stepped away. The man at the end of the line offered to take my order and I accepted. He turned to me as we waited for our food and asked if I knew Frank Ashcroft, a married priest. Of course, I did, I said, as I had once given Frank a private retreat. The man responded, “He married me.” It was then that I noticed his ACC convention name badge, Joseph Martos. I had often seen the name Joseph Martos over the years as a well known sacramental theologian and wondered if he might be the same Joseph Martos that I had known many years before at our Catholic Messengers of the Bible Store Front Center in the Roxbury neighborhood of Boston where I had held charismatic Bible Services and Healing Prayer services and he was a graduate student in theology at Boston College. As we walked to a table he said, “Yes,” he was the same and I was the radical young priest at the store front center in Roxbury. I asked about his writing and he said that he based his theologizing on experience, such as he had experienced at the Catholic Messengers center in Roxbury. I was astonished as I listened to him for the very next night we were going to act on that experience theologically and sacramentally in my ordination to the Catholic episcopacy. I felt that God had placed us together to give me a sense of confidence in what we were about to do which would go beyond the bounds of what would be canonically acceptable but would be profoundly valid and fruitful. Again, I felt the presence of a Higher Power guiding our steps in a form of ‘prevenient grace’ which was making a path where there was no path. The next night, following the invigorating and encouraging addresses of the ACC’s keynoters some twenty of us taxied to St. Anthony’s Cathedral for the ordination. 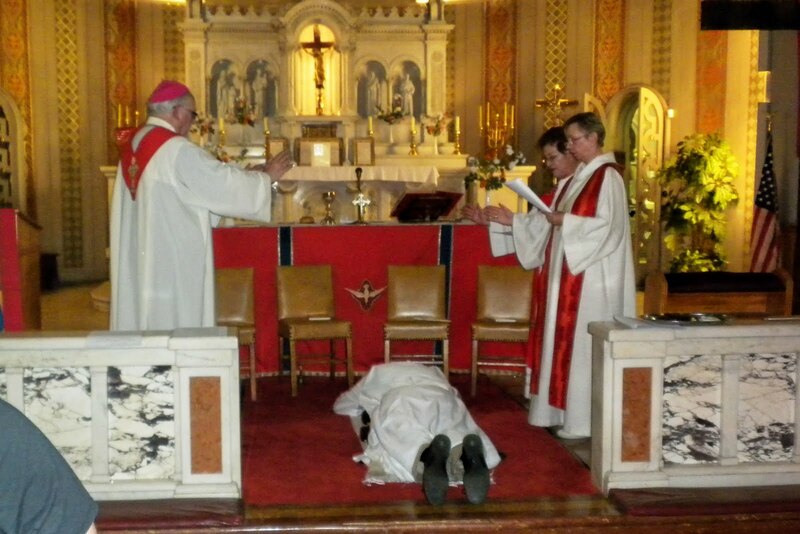 As I lay on the Cathedral floor during the Litany of the Saints I recalled my prostration on the floor of Holy Cross Cathedral in Boston, Massachusetts on a snowy morning during the Litany of the Saints for my ordination as a priest fifty years before and I renewed my commitment to serve the people of God as a servant of Jesus Christ. Two men, Peter Paul Brennan, Roman Catholic Archbishop and President of the Married Priests Now! Catholic Prelature, USA; and Dr. Karl Rodig, Archbishop of the Ecumenical Catholic Church of Christ and Pastor of St. Anthony’s Cathedral; and two women, Christine Mayr-Lumetzberger, Roman Catholic Woman Priest Bishop in Austria and Andrea Johnson, Roman Catholic Woman Priest Bishop imposed hands on me and then prayed the words of my consecration as a Roman Catholic bishop surrounded by the other members of our community of faith representing the spectrum of the Roman Catholic reform and renewal movement. The next day as I left the Cobo Hall convention center I visited on the River walk the sculpture of a group of African slaves, men, women and children who had completed their escape from the slavery states via the Underground Railroad and were looking across the Detroit River towards Canada, a land of freedom. I then proceeded along the sidewalk where I came across a waste receptacle with a pair of crutches sticking out of it. I stood amazed at the sight as I realized I was looking at a symbol of what had just transpired in Detroit, the Gateway to Freedom City: the American Catholic Council with its call to take responsibility for our own faith lives and accept the freedom from paralysis which the Spirit brings as we accept the Word in faith and my own ordination to serve as a spiritual catalyst and encourager in the power of the Spirit. With great joy I stopped Matthew Fox and asked that he pose for a photo with the waste receptacle with its crutches as someone who has done much to help us live free from paralysis.